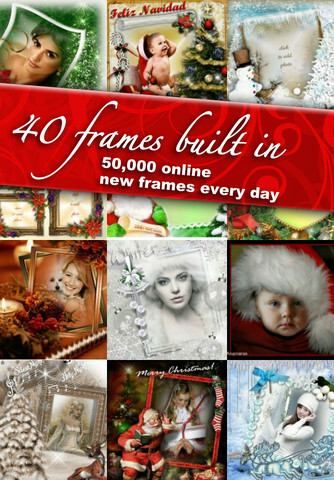 Developer Quote: "Imikimi brings you 50,000+ Christmas frames to make your holiday photos sparkle with Christmas Frames from Imikimi." Open this app and see tabs on your lower display such as: Hot Picks, Frames, Search, My Kimis, Favorites. There are even more categories within these. When you pick a Kimi, you may then include a photo from Facebook, Photo Library or Camera. Edit your pic using features such as Pan, Flip or an assortment of FX. Finally, your finished Kimi creation may be enjoyed by others using Share: Upload to Facebook, Email this Kimi or Send via MMS. Additionally, you may Export your Kimi: Assign to Contact, Use as Wallpaper, Save in Photo Library or Copy to Clipboard! Edit your Kimi at any time by tapping Options to Edit, Delete or View Original. 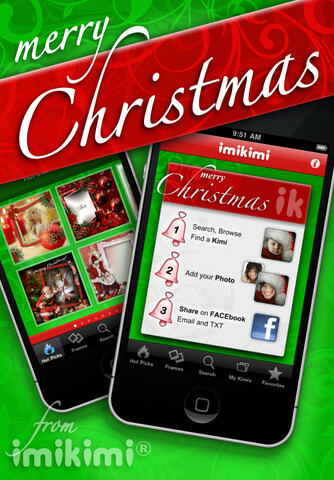 This is why Christmas Frames from Imikimi is a must-have app. Here you will find top-notch templates, but the versatility alone is worth the world to me! I have already placed at least 2 dozen Christmas Imikimis on Facebook so far. As the big day draws closer, my pace is picking up! It just seems that the brighly-hued photos and editing effects make for a more enjoyable and memorable photo than a plain image. Furthermore, the finished product also prints out beautifully when done at home or via the local drugstore processing equipment. (If you are skeptical, just check out Photo Frames Lite from Imikimi). Turn your holiday photos into true gems using Christmas Frames from Imikimi, the utterly simple and enjoyable photo app. COOL CONCLUSION: "Produce sleek, polished, vivid photos using Christmas Frames from Imikimi- easy to create and even easier to share." --iOS/Age Rating: This app requires iOS 3.0 or later. Rated 12+. --Special Note: Check out the full range of Imikimi apps on the App Store. They're worth it!